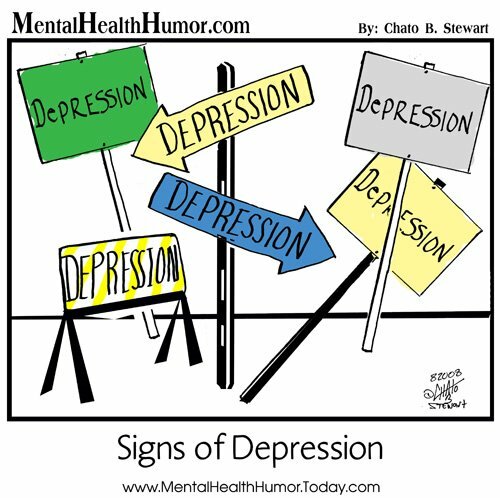 If you’re looking for another website that looks at mental health in a humorous light then you don’t want to miss Chato Stewart’s blog, Mental Health Humor and Cartoons. While Chato always has a daily cartoon, I’ve never found one of them offensive or demeaning. He has a different style than mine. First of all he is light-years ahead of me in quality of drawing. Secondly, his cartoons tend to be lighter and sillier than mine, which likely will make them friendlier to those who might be easily offended by humor about mental health. The last fact about his cartoons is they are always funny. Below is a recent one that I enjoyed. Chato is very generous, in that all his cartoons are free to use on your blog as long as you link back to his site and are non-profit. This can really add some quality to your blog and is especially good for those days that you are having writer’s block. I’ve corresponded with him and have posted three of his cartoons. They are great!!! @ ck and Clueless You’ll find plenty more as funny on his blog. Be sure to check him out. @ Chato It’s comforting to know someone else out there has the same philosophy as I. LOL!!! I love this. I’d love to have a postcard of this and put it on my desk!!! LOL That’s a great one! Classic!